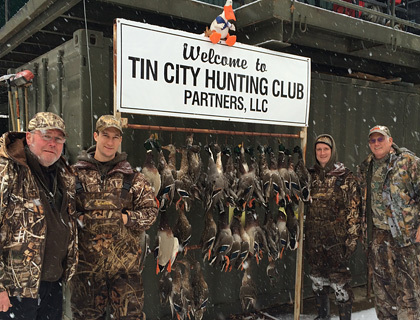 The Tin City Hunting Club is located in Smithmills, KY, just minutes from Henderson, KY and across the Ohio River from Evansville, IN. Realizing the untapped potential of this property, it was purchased in 1997 by a local group of avid sportsmen. This property is composed of over 300 acres of prime farmland, timber, mature cypress sloughs, and wetlands, creating the perfect combination for a wildlife paradise! This isn’t just your ordinary hunting land, it adjoins the 10,000 acre Sloughs Wildlife Management Area! Over 2,000 of these acres are dedicated and set up as a waterfowl refuge, managed for the migratory ducks and geese! What better neighbors could you ask for? Each fall, ducks and geese make their way back to the flooded crop fields of this refuge and the surrounding areas, knowing there will be an abundance of food and open water. The club has dedicated a tremendous amount of time and funding to develop this property into one of the most sought after waterfowl destinations in the region. Although waterfowl is our primary focus, trophy whitetail and turkey hunting is also available. Numerous 140-165” whitetail have been taken on the property over the past years. In the world of water fowling, having open water when and where you need it is an absolute necessity. Water is never a problem on our property. We utilize numerous water wells, 6” electric pumps, and water control structures to monitor and manage water to the exact levels desired. Mother Nature is too unpredictable, so utilizing our water wells is essential to ensuring we have sufficient amounts of water every fall and winter. Even during the hottest and driest of seasons, we will have water in October. Every avid water fowler knows that the colder it gets, the more active the birds will become in search of food. The biggest problem for many hunters during these cold fronts, are the freeze ups that come with them. At Tin City Hunting Club, we ALWAYS have open water. Water wells pump 54 degree ground water into the cells and electric “ice eaters” create turbulence in the water to ensure freeze ups do not occur; even in the single digit temperatures. 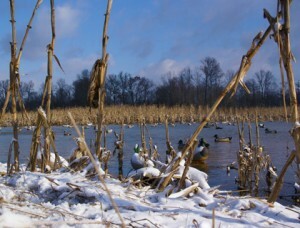 Standing corn and open water on a single digit morning makes for an unbelievable combination! We custom plant all of our excavated water structures with corn and various other seed producing plants such as milo and millet that waterfowl thrive on. The crops planted in these cells are not harvested, but flooded each fall and let stand for the migrating ducks and geese. We have numerous other crop fields and food plots on the property to ensure year round food and nutrition for all of the local and migrating game. Tin City Hunting Club limits the number of annual memberships and partnerships to ensure a great hunt for everyone who hunts with us. We restrict hunting hours and days to help lower the hunting pressure, giving the birds a chance to roost on our property each night. We have numerous pits and blinds throughout the property, so we are able to rotate blinds to help keep from applying too much hunting pressure to any one area. Many days at the club may consist of 3-5 hunters on the entire property! We have no desire to have large groups of hunters coming in day after day. We focus on the quality of hunts, not the quantity! Safety is ALWAYS our #1 priority while hunting! We practice and demand safe hunter etiquette at all times. At Tin City Hunting Club, you will quickly learn what waterfowl hunting is all about. Many of the pits and blinds are heated, keeping you comfortable on even the most frigid mornings. The pits and blinds keep you dry and out of the wind, allowing you to enjoy any type of weather condition. A couple blinds have electric, so fresh coffee is always brewing, cold beverages in the mini-fridge, and our famous hotdogs on the griddle! The decoys stay out at several blinds, so there is minimal time wasted before the mornings hunt. Several of our partners and members have raised and trained some incredible retrievers that accompany us on most hunts. Watching these discipline dogs track down and retrieve the birds is simply amazing to witness, not to mention saving us some mileage in our waiters. Many of the blinds can be driven to by UTV, where you and your gear can be dropped off. No excuses, no hunter is too old or too young to be able to enjoy a hunt with us! The good ol’ days of duck hunting have changed drastically over the years. Let’s face it, in today’s fast paced society, we all seem to have less and less time each season to devote to our passion for waterfowl hunting. To be successful on the rivers, you are going to need to pray for flood water, scout out a good spot, wake up 3 a.m., pull your boat to the ramp (typically ice covered on the good mornings), then boat an hour in the dark and drift covered river, hope no one has beaten you to “your” spot, put out decoys, make a blind, and hope the birds show up before the landowner or person leasing the property runs you off. We’ve all been there… not exactly the hunt you want to take your kids on while trying to spur their interest in our hunting tradition. This is where Tin City Hunting Club comes into play. We are seasoned hunters, hardworking individuals that understand most people today don’t have all the time and resources to devote to creating the perfect hunting property on their own. As a club, we put in countless hours and tens of thousands of dollars each year creating and maintaining this extraordinary property. Starting in the spring with planting the crops, leading into late summer working on pits and blinds, and flooding the fields in the fall. In addition, we place decoys and floating blinds to ensure our partners and members have the best opportunity to have a safe, enjoyable, and successful hunt. We work year round to make sure when the birds start flying in late November, all we have to do is get in the blinds and get ready for some unforgettable waterfowl action! So if you are like a lot of us whose work and/or family life doesn’t allow you to chase your hunting passions each fall like you wish, consider making the very most of each minute, and come hunt with us at Tin City Hunting Club! 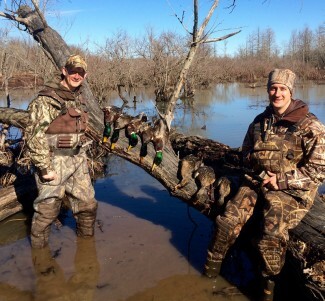 Tin City Hunting Club experiences unmatched success in the region when it comes to water fowling each season. We have averaged 3.6 birds per hunter, per day over the last 3 seasons. 1821 ducks and 110 geese were harvested in the 2012-2013 season alone! 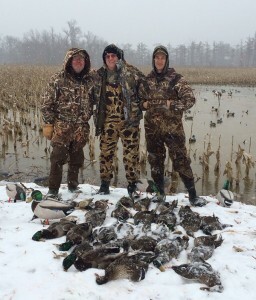 Mallards, pintails, gadwall, wood ducks, teal, black duck, widgeon, and many more are harvested each season. Geese are also a good possibility when hunting one of the field pits. Numerous banded birds are taken each season. No guarantees in fare chase hunting, but our numbers over the years speak volumes for the incredible potential this land and club pocess. Tin City Hunting Club is comprised of a terrific group of individuals who share their passion for hunting and the outdoors. We have the utmost respect for the land and the game we pursue, strictly abiding by all laws and regulations to ensure we set a good example to all those hunting with us, especially the youth. We are from different cities, states, and towns, young and old, from all different backgrounds and careers, yet we all share this common bond as hunters. We treat every person that hunts with us as if they were family. The camaraderie, stories, and amenities that are shared and enjoyed, leave us with a smile, even on the slowest of days. We look at every day in the blind as a blessing and will cherish the fond memories of our hunts together for a lifetime! Tin City Hunting Club has a lodge on the property that has a full kitchen, 2 full baths, and sleeps 10 comfortably. Whether staying for the night, or just stopping in to warm up after the morning hunt, the lodge is a nice place to relax and share stories with fellow hunters. 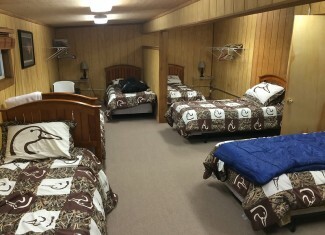 The lodge is equipped with heat and air, comfortable bedding, satellite TV, indoor hanging and drying racks for boots and waiters, dog kennels (outside under a covered porch), duck cleaning station, and storage buildings for ATV’s and other hunting necessities. We have a back up generator in case of bad weather and power outages. The club also has UTV’s, tractors and implements, 3 mud boats, nearly 100 dozen floating and full body decoys, dozens of motion decoys, numerous floating blinds, several heated underground pits and wooden blinds and just about anything else you could need to run a successful hunting operation.